I always think it’s odd when someone gets their black belt and then walks away from karate. 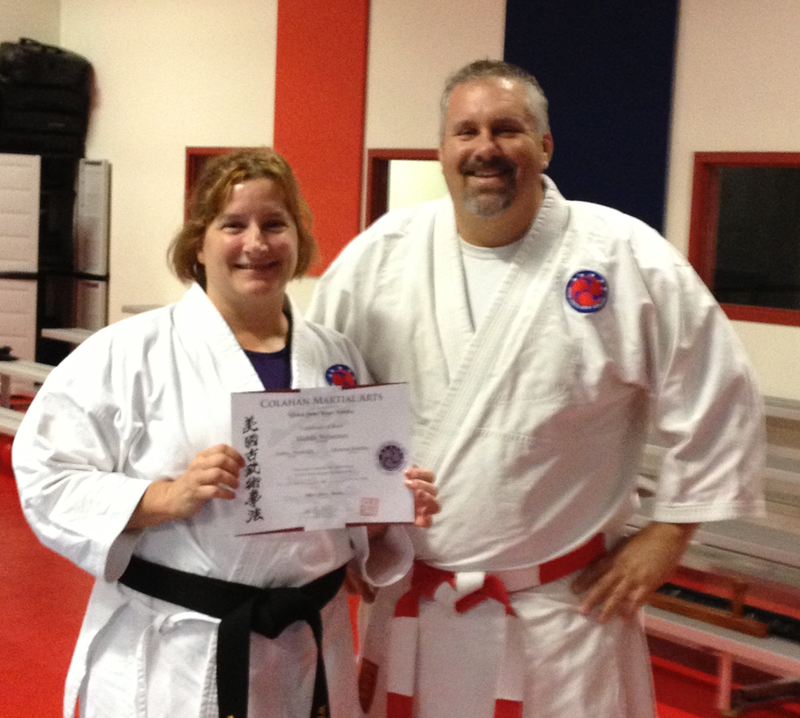 That said, I just got my Shodan in Kobujitsu (Weapons) in May. And after way too much thought, angst, deliberation, and uncertainty, I’ve decided to take a break from my karate training. Am I walking away permanently? I don’t know. But in some ways I feel I’ve become one of “those” people. I know Shodan is just the beginning of the journey and there is no end to things to be discovered. And truthfully, I really enjoy weapons and would love to spend more time studying them. So why, when admittedly I think it’s dumb, am I walking away? 1) I travel a lot for work. Incorrect. It’s been over a year since I visited our NY office. 2) I work too much. My fatigue says that’s true, and often it’s tough to get to classes. But again, incorrect. True, but once more, incorrect. Tomorrow I see the podiatrist who says he can fix my lingering foot issue, but only if I take a break from karate. Someone who spent 7 years running full tilt at hurdles, racing with a knot the size of a golf ball on their knee, and wiping out on an irregular basis isn’t really afraid of working through yet another injury. Simple. It’s time to give back. I’ve spent the last 8+ years focusing on myself, spending my time and energy on martial arts and my achievements. But lately, I’ve been convicted of selfishness. Nobody’s world will change if I learn another set or kata or whatever. Nobody besides me benefits from me earning a higher rank. In a world that seems more uncertain each day, I need to do my part to make a difference. I’ve recently connected with two charitable organizations, and I’m devoting my time, my writing and my kitchen skills to those. I don’t know where these opportunities will take me. I don’t know if I’m taking a temporary or permanent break from karate. But what I do know is I need to do this. I need to do my part. So in a way, maybe I’m being selfish still, but if that’s so, I hope someone else benefits from it. Move over, June Cleaver… It’s a new era! I’m off work today in honor of Martin Luther King, Jr. I haven’t been off on MLK Day since I was a kid in school, so kudos to my employer! I’m off work, but it’s been a busy day. 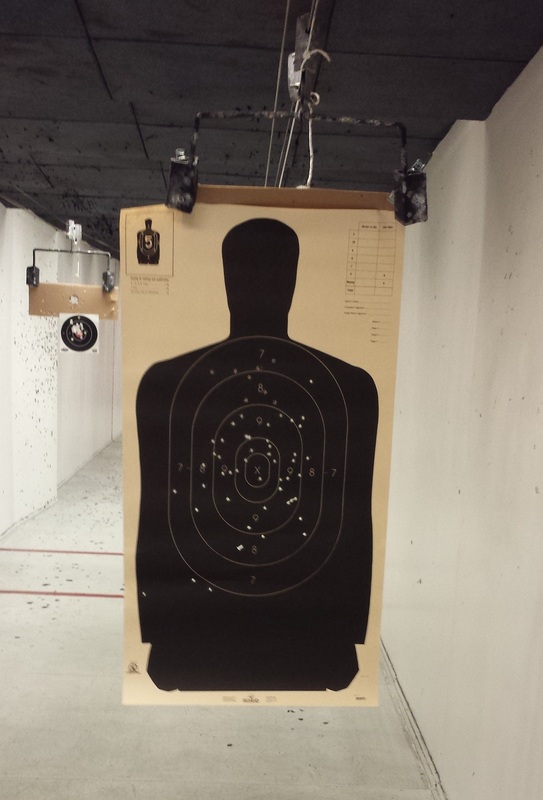 I went to the shooting range first thing to work on my aim. Which isn’t the best, which is why I was at the range. I thought I did OK (meaning I hit the target) but my aim is off and I pull to the left a bit. I sent a photo of my target to a friend who replied, “Was this with a shotgun?” OK, yeah, it does look like a shotgun did the damage! Next up was the nail salon! I’d trashed my nails more than usual this past week shopping, cleaning the garage and chasing the dog, and my nails needed a total re-do. I certainly hope this isn’t a weekly habit; gel manicures aren’t cheap! But I do love how my nails look when they’re fresh. My nail tech commented, “This is the only girly thing you do, isn’t it? Get your nails done.” Hmmm… Sorta. After a quick run to the grocery store, I came home to bake cookies. Tomorrow is my baby’s 24th birthday! He loves Oreos, so I baked some Cookies & Cream Cookies for him. (I’ll post that recipe later this week when I’m not shooting, kicking, or baking.) I might have taste-tested the Oreos along the way. And thus ended my domesticity for the day. Happy Birthday to The Pretty One! Cherish your kids – they grow up way too fast. Well, this is as “girly” as I get. 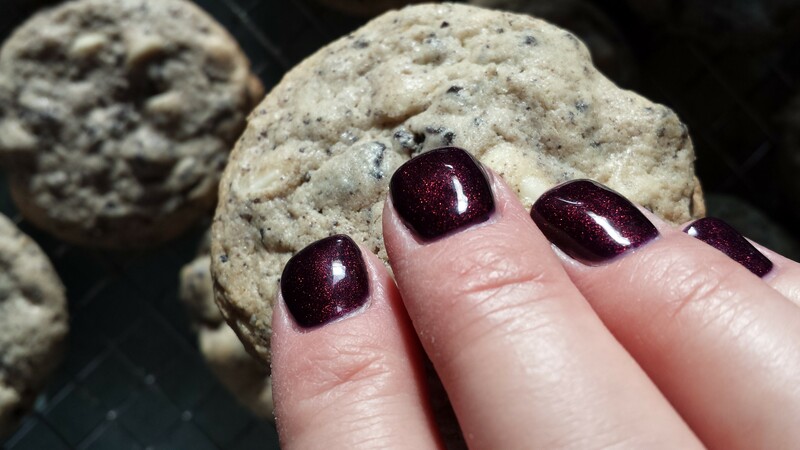 Nails and baking. But I would also argue that the shooting and martial arts are girly too. At least these days they are! I know very few women (OK, none) who wear their pearls to vacuum and whose big goal of the day is to have the perfect dinner on the table when their breadwinner husband comes home from work. I do know quite a few women who are the breadwinners, who enjoy martial arts as much as a manicure, and shooting a pistol as much as playing in the kitchen. This is a new era. Many of us have chosen to embrace our “girly” side. ALL of our “girly” sides, including the pedicures and the pistols. Personally? I was never the pearls and vacuum type. Move over, June Cleaver. This is a new era, and it fits me well! I whooshed my bo tonight! I’m SO excited! I’ve had the toughest time getting my bo to whoosh. Everyone around me has been whooshing for a long time, but I was only able to get a slight whisper. The only whooshes I’d made were me saying Whoosh. 😀 I’ve been trying for 2 years! Honestly, I’d given up on ever hearing a real whoosh from my bo, so tonight was really fun for me. Hooray for those little breakthroughs, even if they take 2 years to happen. It was worth the wait! Brown Belt in Okinawan Kobujitsu! Last night I earned my 3rd brown belt in Okinawan Kobujitsu (Weapons). Yea! A couple of weeks ago Kyoshi asked me if I thought I was ready to test. I wasn’t sure and said so, then asked what he thought. Kyoshi said he needed to see me run through my weapons again before deciding. In my opinion my tonfa kata was fine and my sai kata was fine – up to a point close to the end which confused me for some dumb reason. I was having trouble keeping the bo katas straight, though, and couldn’t remember the name of any of the katas for the life of me! After my talk with Kyoshi I spent the weekend studying. I worked the bo katas in my basement using my broken bo. I stabbed myself a couple of times and scraped up my arms with the broken end, so I might have to sand that down if I’m going to do that more often! I worked one kata repeatedly until I thought I had it, then I moved on to the next one. I attached the names of the kata to the actual katas. I even made a cheat sheet of a few moves in two of the katas where I was mixing up the moves. Amazing how much that cheat sheet helped! While I was studying that weekend I discovered that for the most part, I knew the katas. I’d done them many, many times in class. I just needed to focus on them one at a time, with no distractions, and do them again and again. The names just needed to be refreshed in my brain and that didn’t take long. And on Monday I went to class and showed Kyoshi my kata. I surprised him by knowing the names of all of them! And then I waited for his decision on whether I was going to test or not. I was very excited to hear my practice paid off! I would test! So last night was my test. 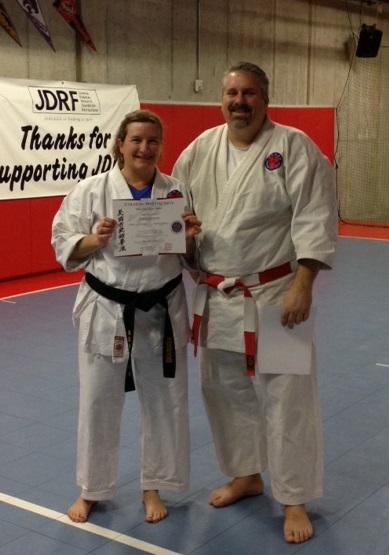 I remembered my kata, I remembered the names, and I passed! Whee!!! OK, celebration over. Time to get back to work! You’ll know you did it right if you’re still standing! Hooray!! I earned my purple belt in Weapons! I was so excited I almost forgot to bow to Kyoshi when he called me up for my certificate. Oops!